Each Disney resort offers a plethora of unique amenities; cool features that add to the magic. Here is my list of favorites. 1. 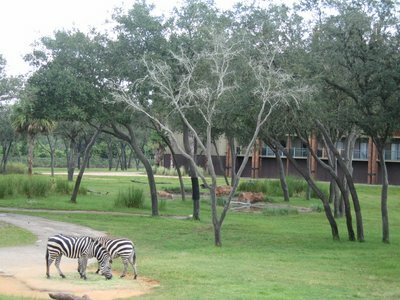 The Savannah at Animal Kingdom Lodge- Watch Giraffes, Zebra, and Ostriches roam the grounds of this exquisite hotel. 2. Twister at Pop Century-Found painted on the ground at Pop Century, is a twister board complete with spinner! Go ahead, you can play! This is a great little game that is set out of the way. A perfect thing for a family to do after a day in the parks. 3. Pony Rides at Fort Wilderness- At what other resort can your kids saddle up and head out (or around in a circle) on a Disney pony? This is a great little activity that will be fun for your little ones! 4. Sammy Duvall Water Sports at The Contemporary Resort-There is no where else on property that you can partake in parasailing, water skiing, tubing, and wake boarding. These activities cost extra, but are offered only at the Contemporary through Sammy Duvalls. 5. Stormalong Bay at Yacht and Beach Club- This sand bottom pool is the best on property. The pool slide is amazing and you can rent tubes and noodles to float along the lazy river. The pool is over three acres of water fun! This entry was posted in Resort Info, Top Five, Uncategorized and tagged animal kingdom lodge, Contemporary, fort wilderness, pop century, Resorts, Sammy Duvall, top five. Bookmark the permalink.